because of hot tea on them." "Oh, do not make fun of me. with birds then, doesn't it." "Oh, you are right, madam. Let us take half of the prize out then!" The theory indicates that the climate in Edo era was in cold age in the long-terms weather change and is supposed to have been much colder than today where temperature is getting warmer. Brazier were made of metal, wood and ceramic and their shapes were circular, square, rectangle. There was also a hanging brazier. They used braziers with wood frame in common peoples' family. 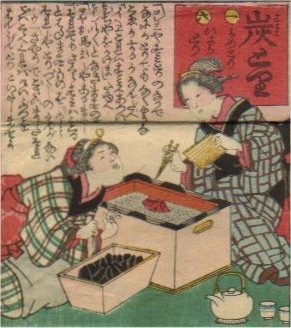 So called cats plate (because cats often lied there) covered one side of rectangle face to heat iron pots, chirori (sake warmer) or tea pots and a drawer is built in underneath.